Tux Paint is a child-friendly digital drawing application which was built for children aged 3 to 12. Due to its user-friendly interface, great flexibility and fun sound effects, it is being used in lots of elementary schools around the world. According to its maker, the program runs great on the macOS, Windows, Linux, Android and iOS operating systems. It utilizes a fixed size canvas, which adjusts itself to the detected screen resolution without needing the user's intervention. Tux Paint can run fine even on small screens, provided that they are able to display images of at least 640x480 pixels. Loading and saving is done visually, using a thumbnail-based system, so children won't need to bother with keeping track of their creations' names, or remembering complex file paths. Tux, the "official" Linux penguin, will also help kids by giving them context-based tips and hints. 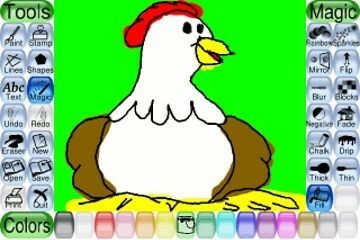 Tux Paint has got lots of useful drawing tools. The "Paint brush" option provides brushes of various sizes, shapes and colors that can be static or animated. Parents can create their own brushes, which will be added to the program's dedicated collection. The "Rubber stamps" tool includes hundreds of stamp images, which can be assigned various sound effects and texts. Stamps can use custom PNG files which support transparency, as well as SVG vector graphics. The program also includes tools that will help kids draw lines, shapes or add text and labels. The list of "special effects" is quite impressive, including blinds, blocks, bricks, calligraphy, cartoon, chalk, color shift, confetti, drip, emboss, fisheye, flower, foam, glass tile, grass, hexagon mosaic, kaleidoscope, metal paint, Picasso, rain, ripples, rosette, silhouette, snow flake, square mosaic, TV, toothpaste, tornado, wet paint and more. In addition to this, parents can create new tools for their children by using the plugin-based programming interface. Tux Paint can also create slideshows that utilize the desired drawings. You can control animation playback speed, loop the images, or change them manually, by making use of a mouse or the arrow keys. Beginners to drawing can get started by playing with the built-in images and photographic scenes. The program supports international text characters and has been translated in more than 100 languages. It provides an on-screen keyboard and allows children to control the mouse pointer using either the keyboard or a joystick. Parents can tweak the application to their liking, thus making sure that kids don't delete other programs accidentally, for example. Printing can be disabled for good, or you can give your child the ability to print a picture per hour, for example. If you've got kids, Tux Paint is a very solid proposal. Visit the official site and download the application by clicking the button below. We are Velma and James Kraemer, two teachers who have two great children. If you like what we're doing here, be sure to spread the word about our site. Thanks!